Why does NASA cover its spacecraft with gold? Most of the gold-colored stuff you see is kapton film. It’s a kind of plastic, with a very thin layer of gold on its surface and a layer of silver behind it. Spacecraft builders attach the delicate kapton to a tough fabric of fiberglass before wrapping it around the spacecraft. A Kapton-fiberglass blanket is about as heavy as a blanket on your bed. This golden blanket protects the spacecraft from the sun’s heat. The more solar heat protection a spacecraft needs, the more layers engineers add. The MESSENGER spacecraft, which is scheduled to orbit the innermost planet Mercury in 2009, would bake at 400 degrees centigrade with no protection. Ten layers of insulation will help keep it a little cooler than normal room temperature. Gold reflects 99 percent of infrared radiation that falls on it, so some scientific instruments carry a very thin layer of gold plating to protect them from the sun’s heat. Gold can be applied so thinly that light shines through it, so it’s an excellent protective coating for glass. That’s why the faceplates of helmets of astronauts on the moon shone like golden mirrors. There are a variety of qualities that gold provides. First of all, it does not oxidize in air. Thus the coating does not degrade prior to launch. Silver will tarnish and aluminum will oxidize. But gold stays very clean. Thus gold is an excellent coating for optics. Second, gold is electrically conducting. 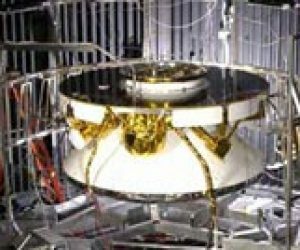 One purpose of MLI blankets is to provide an equi-potential surface — that is, the blankets can conduct electric charge so that static electricity does not build up in one particular part of the spacecraft. Without this conducting layer, static discharges could short out sensitive instruments and other electronics onboard. Why are some parts of a spacecraft covered in gold? Not all spacecraft are gold coated. Voyager had black blankets because it wanted to absorb the heat from sunlight. Galileo and Cassini had a mix of gold and black blankets, because they both had to fly to Venus for gravity assists, but also had to operate far from the Sun at Jupiter or Saturn, respectively. On some spacecraft, like Magellan, the Venus radar mapper, the MLI blankets are made to be white to reflect the maximum sunlight, rather than golden. MLI also provides protection from micro-meteoroid impacts. It is built up of many layers, each with a special purpose, or sometimes, repeating the purpose of other layers. Sunlight in space is many times more powerful than sunlight on Earth. Earth’s atmosphere screens out much of the radiation from the Sun. In space, a few inches of thermal insulation does the same job as a hundred miles of Earth’s atmosphere. Kapton is quite delicate; too much sunlight will cause it to break apart. For this reason, the MESSENGER spacecraft included a ceramic fabric sunshield. Spacecraft builders place some other material – for example, dacron netting – between the silverized Kapton-fiberglass fabric layers. This cuts down on heat transfer between the layers, helping to prevent solar heat from reaching the spacecraft’s interior. They cut the thermal blankets using scissors based on paper patterns. They sew the layers together using a sewing machine, and use special tape to seal off the edges of the blankets. They leave small holes in the blankets so that air trapped between the layers can escape when the spacecraft enters the vacuum of space. Otherwise, the blankets would blow up like a balloon and burst. The amount of gold on spacecraft can be measured in ounces. If all the gold on the typical spacecraft were gathered in one place, it would weigh less than a typical wedding band.